Florida burns a lot of trash every year, so it's hoping Irma's destruction can at least provide an energy source. Hurricane Irma brought huge storms and destruction to the Sunshine State, and it also left Floridians with a not-so-welcome gift: huge piles of trash and debris. But rather than throwing all that wreckage into a landfill, the state is turning it into electricity. Florida has more waste-to-energy plants than anywhere else in the U.S. The plants burn garbage and harness that energy to run power grids across the state. In 2016, the state burned 4.5 million tons of trash — enough to power more than 270,000 homes. 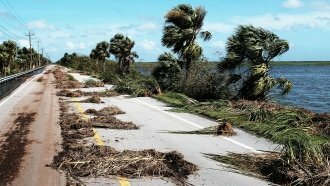 In the days before Irma made landfall, the Florida Department of Environmental Protection worked with local governments to create disaster-debris sites where people could drop off their waste. This got rid of trash that could become projectiles, and also gave the state a reserve fuel supply for power after the hurricane passed. And people responded en masse. In Miami, residents threw out an estimated 650-750 tons of trash per day before the storm even hit — nearly twice as much as the city picks up on an average day. And solid waste officials around the state are still seeing huge amounts of trash coming to these sites. In Hillsborough County, which includes Tampa, there's been about a 20 percent increase in the total amount of garbage dropped off for use as fuel.